Because I’m interested in politics, I make it my practice to follow various politicians on Twitter, whether I agree with them or not, including all the local ones I can find. My local federal MP Andrew Robb would have to have the single most relentlessly negative Twitter feed of any of them. Here’s all his Tweets for the past week (excluding retweets and also those addressed to other people, therefore not showing up in most users’ timelines). I see Wayne Swan has a juvenile petition out on cruel cuts, I presume he’s referring to his cruel cuts to community grants. #hypocrite. Swan and Wong need to stop the spin and explain Labor’s $120 BILLION BLACK HOLE. Labor has reached the dangerous stage, saying and promising anything to save political skin. #Labor’s$120billionblackhole. Chickens come home to roost – Labor’s $120 billion budget black hole revealed in Fin Review. Financial Review reveals Labor’s $120 billion black hole. Is there a policy Labor has implemented without botching it?? Think pink batts, NBN, mining tax, carbon tax, live cattle, border protection. Let’s judge Labor’s record debt by Australian standards, rather than against the basket cases of the world. It leaves us vulnerable. If Labor is returning to surplus why in budget did they raise the Commonwealth debt ceiling to an unprecedented $250 BILLION?? Why did Labor tell us net debt would peak at $94.4 billion two years ago, but now it’s $145 billion? Only $50 BILLION out! $4.1 billion unfunded dental promise, part of Labor’s $100 BILLION BLACK HOLE of unfunded or hidden budget liabilities. Labor promises $4.1 billion for dental scheme but can’t say how it will be funded. That means higher taxes or more record debt. Penny Wong’s credibility through the ‘floor’, see what she said before & after Labor’s carbon tax floor price backdown. Labor told us the carbon tax floor price was needed for certainty, now they tell us the opposite. They are a shambles. Labor’s carbon tax chaos recipe for budget black hole but Combet says trust our modelling!!! At last election Penny Wong said net debt would peak at $94.4 billion; now that figure is $145 billion. A $50 BILLION blow-out in 2 years! Penny Wong in denial. BHP has warned for months investment climate is being crippled by carbon & mining taxes & other sovereign risk issues. It’s all attacking Labor. EVERY. SINGLE. TWEET. Not a single comment about what he would do in government. Not even a single comment on what he thinks Labor should do. Even Tony Abbott, derided by Labor as “Doctor No”, often tweets about the people he meets and the events he attends. As the next generation of voters increasingly get their information from social media rather than mainstream media, it’s going to become important for politicians to represent themselves better through avenues like Twitter. With a growing and changing population, even Goldstein won’t be blue-ribbon Liberal forever. C’mon Andrew, surely you can do better than this. Just for a moment, stop telling us why you think the other guys are idiots, and instead tell us why we should vote for you. Why are Twitter messages 140 characters? Did I post this already? I don’t think I did. Hopefully not. Because they were designed to fit into the 160 characters of a text message, with some characters filled up with header information and so on. So why are text messages 160 characters? Because they fit into 140 bytes, or 160 7-bit characters. That, in turn, was so the messages could fit into unused space within the signalling formats used by phone networks. The Wikipedia entry on SMS for lots of geeky stuff about its origins. This month, Cathay Pacific partnered with Klout to offer to anyone with a score over 40 free entry to the airline’s business class and first class lounge at San Francisco International Airport, the key hub for those working in Silicon Valley. Neat, but it appears you had to show your Klout score on an iPhone app. Difficult if you don’t have an iPhone, though I expect the vast majority in Silicon Valley do. The managing director of recruiter Kelly Services Australia, Karen Colfer, is not on Klout, but says everyone should have a LinkedIn profile. “If you are not on LinkedIn, you are not serious about your job,” she says. With a 23-year career in recruitment, Colfer says background checking is becoming increasingly thorough and information is easier to get. Google, LinkedIn and blogs are all fair game, she says. — How much Klout do you have online? I’m not a big Klout user, though I admit to being curious, so I did take a look. Mine is 51% (to be precise, 50.97) — a bare pass, I guess. 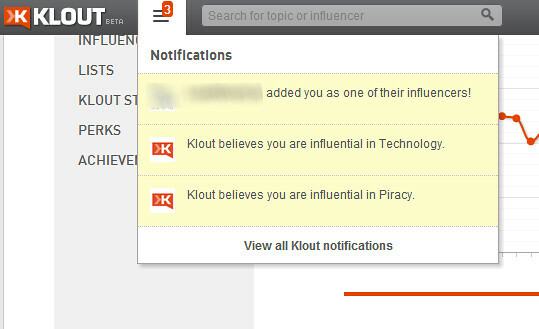 I’m faintly amused that Klout believes I am influential in piracy. Arrrrrr, me hearties. Piracy eh? Well… it’s true that one of my eyes doesn’t work. Amidst the outrage about changes to Metro’s Twitter feed, there are claims that it used to include train cancellations. This was not so. They did not tweet individual train cancellations or diversions. These only went out on SMS to subscribers, and on the web site. But what they did tweet was disruptions/delays (whether minor or major) to multiple trains. Since this week, they’ve held back on most of these. Metro argue that people don’t want to be swamped by tweets of limited relevance to them. But the 10,000+ followers didn’t seem phased by that — perhaps because Twitter is such that (within reason) it’s pretty easy to skim through tweets as they’re posted. If you see one that doesn’t apply to a train line you use, you can easily not read it. Of course, it might have been a problem if the Twitter feed had included individual cancellations. That might have swamped people with too many updates. But as I say, these weren’t posted on Twitter. 2. And that they instead post messages that claim all is running smoothly, even when there are cancellations or “minor” delays on some lines — such as this morning’s effort: “Train services running smoothly so far this morning. We’ll tweet any major disruptions if they occur. #MetroTrains” — when in fact there had been at least three cancellations. They are recommending people sign up for SMS alerts, which can be quite good (and give people’s personal station times, rather than what the web site does, which is make you work out what time a cancelled train would have passed your station) and genuinely alerts you, even if you’re not looking at Twitter or the web. But it’s a bugger to sign up to, especially if your regular travel times vary… and it’s costing them a bomb to send out all the alerts. Oh, and there’s the minor detail that it doesn’t work after 8pm or on weekends. What they should probably do is what V/Line have done, and set up individual Twitter feeds for each line. These could list every cancellation, disruption and delay (as per the web site) — in fact like this unofficial set of feeds* (which scrapes the web page). Then Metro can go ahead and use the main MetroTrains account for just feedback and major disruptions. People can then follow what they want, and get information pushed to them as they need it. Everybody wins. More broadly, once the PTDA starts up (and subsumes Metlink), it would arguably be better to put all operator updates under their umbrella branding (whatever that will end up being) — provided the information can be posted quickly and efficiently, of course. That’s what Translink South East Queensland does (though at first glance they don’t appear to be posting bus updates). By the way, Metro deserve credit for actually engaging with people on this issue on Twitter. Hopefully they’ll move to continue providing the information people want to see through Twitter (and through other avenues). There’s no reason they can’t be both informative and chatty. I’m not having a go at anybody in particular here, but making a point. A couple of people re-tweeted it, with this one adding a comment. While some people look good in lycra, It is perhaps appropriate here that I reiterate my pledge to the Victorian people that I will never, ever, wear lycra in public. So in fact Pallas didn’t say anything was wrong with lycra. He just made a funny, self-deprecating comment that he shouldn’t wear it. Maybe you should read the full quote? I did and the issue isn’t even worth answering. It just gives credence to the doped on the other side. Does that actually make any sense? I’m seeing words there, but I can’t comprehend the meaning. I didn’t bother taking it any further. But my point is that while I love using Twitter, the brevity of messages shouldn’t be an excuse for wilfully ignoring context, nor blasting away with both barrels when you make an assumption as a result of that lack of context, particularly when the link to all the information is merely a click away.